This beautiful mr2 Farm Door Table or Desk finished with your choice of stain and lacquer. 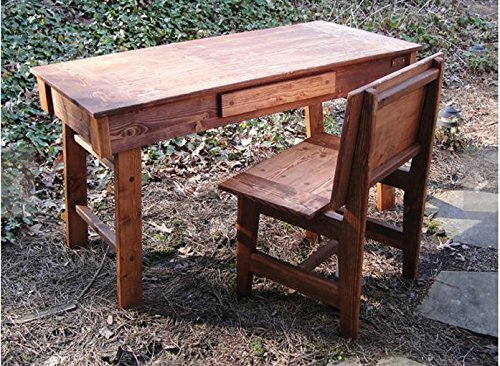 The desk is 21" Deep x 29 ½" High available in widths between 36" to 54" Wide. Minor changes in dimensions can be made without additional charges. A 25" and 32" Deep Desk is also available on this website. Or... we can provide custom desks to meet your specific needs. An optional desk drawer is also avaiable - The top and shelf are made with multiple knotty pine boards which have been secured together with biscuits and wood glue for maximum strength. The top is secured to the apron with 3 1/2" screws and covered with oak dowels. Additional dowels are used to simulate the attachment of the top and bottom cross pieces on both the top and shelf. - The Leg Assemblies are secured with a cross bar and attached to the table top with two 5" lag bolts for maximum strength. - The Printer and Accessory Shelf is 14" Deep and the width is dependent upon the desk size selected. The shelf snaps onto the cross piece of the Leg Assemblies to secure the four legs and increase rigidity of the desk. The shelf is slotted so it can slide between the legs to provide maximum accessibility and leg room. - An Electric Utility Shelf is provided to hide the power outlet. - The desk has multiple coats of polyurethane on all surfaces. The piece is also available in larger sizes on the website. - The table ships disassembled and each piece is individually bubble wrapped and multiple layers of cardboard are used for maximum protection in shipping. Drop shipment to the closest Greyhound Package Express Station for pickup and insurance costs are included - This table also comes in Pumpkin Pine, Black, Olympic Green, Dark Walnut, Mahogany, Maple, Pine, Russet Oak, Natural, Cherry or a color of your choice. The finish can be natural, satin, semi-gloss or gloss. Custom item, shipment would be 30 days and is dependent upon backlog.